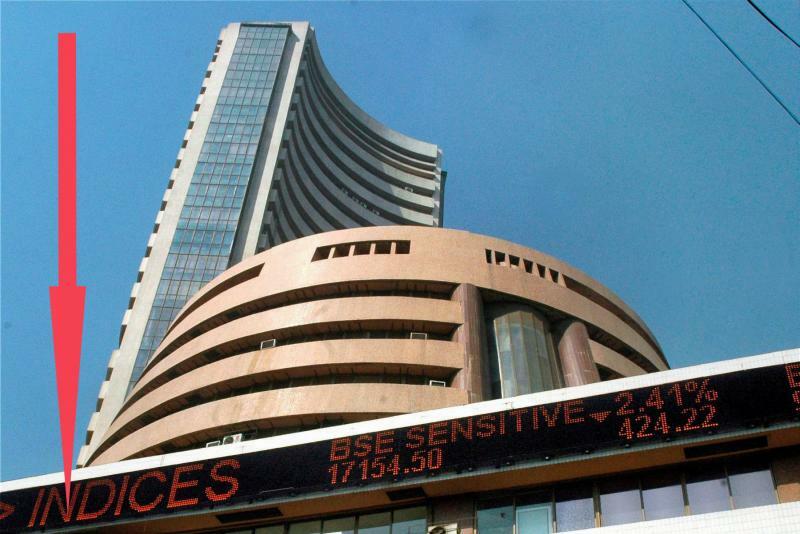 The BSE Sensex declined about 67 points in early session today on profit-booking by speculators amid mixed Asian cues on worries over a US-China trade war. The 30-share flagship index was down 67.80 points, or 0.18 per cent, to 35,621.80. The gauge had soared 257.21 points in the previous session on Friday. Sectoral indices led by oil and gas, auto, banking, PSU, power and infrastructure stocks fell by up to 0.53 per cent. The 50-share NSE Nifty turned lower by 20.60 points, or 0.19 per cent, at 10,801.25. A depreciating rupee, which slipped 29 paise to quote at 68.13 against the dollar today, made traders all the more nervous. Hero MotoCorp, Tata Motors, ICICI Bank, ITC Ltd, Axis Bank, PowerGrid, Maruti Suzuki, ONGC, HDFC Ltd, NTPC, RIL, Yes Bank, Coal India and SBI slid up to 1.39 per cent. Foreign portfolio investors (FPIs) sold shares worth a net Rs 1,343.44 crore, while domestic institutional investors (DIIs) bought shares worth a net Rs 1,105.76 crore on Friday, as per provisional data. Hong Kong's Hang Seng weakened 0.49 per cent while Japan's Nikkei lost 0.34 per cent in early trade. Shanghai Composite Index, however, moved up 0.17 per cent. US Dow Jones Industrial Average ended 0.49 per cent higher on Friday. The rupee weakened by 29 paise to 68.13 against the dollar in early trade today as demand for the American unit from importers and banks picked up. Shruti Haasan gains weight for "Behen Hogi Teri"